All transactions are safe and secure with a reliable history in online purchasing behind each of our associates. Buy the Monty Python and the Holy Grail Collage t-shirt to own Monty Python clothing and merchandise. This navy Monty Python and the Holy Grail t-shirt features a Monty Python collage on the front of the tee. The design shows images from the Holy Grail and various other Flying Circus skits. Several familiar characters are visible. Wear it whether you're a fan of the movies or the Flying Circus sketch comedy series. Co-directed by Terry Gilliam and Terry Jones, pair this T with the officially licensed movie poster art for Monty Python and the Holy Grail. 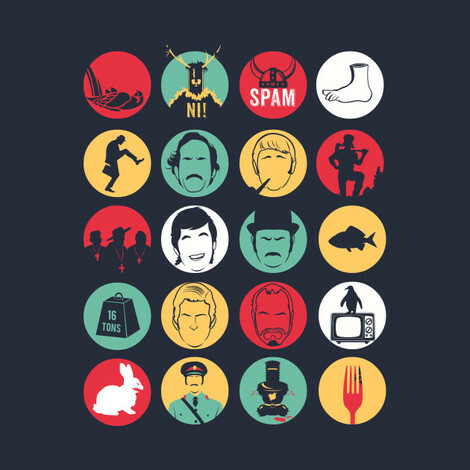 In addition to the Monty Python and the Holy Grail Collage tee above, browse the Monty Python Clothing Gallery for more apparel like men's and women's clothes, kids shirts or hoodies.